Mild SPOILERS for Ralph Breaks the Internet ahead. Ralph Breaks the Internet directors Phil Johnston and Rich Moore have their doubts that Wreck-It Ralph 3 will come to pass. The original Wreck-It Ralph hit theaters back in 2012 and was quick to become both a critical and commercial success for Disney. Moore, who also helmed the first Wreck-It Ralph, was similarly quick to confirm that a sequel was in the works thereafter, as were stars John C. Reilly and Sarah Silverman (who voice Ralph and his pal Vanellope von Schweez, respectively). Ultimately, however, Ralph Breaks the Internet ended up taking six years to make it to the big screen. 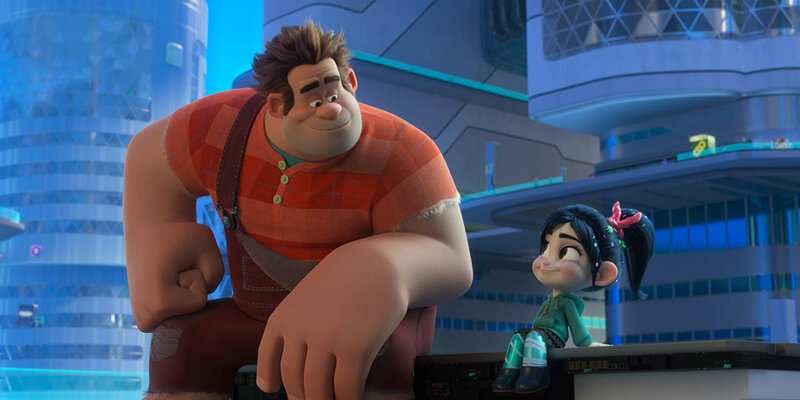 The Wreck-It Ralph sequel picks up in real-time and reveals that, since their journey in the first movie together, Ralph and Vanellope have become the best of friends and do pretty much everything together (be it speculating about Zangief's body hair or getting root beers at Tapper's). However, when the pair venture out into the Internet to find a replacement for the broken steering wheel to Vanellope's game, Sugar Rush, Vanellope comes to realize that she wants something more than her life in Litwak's Family Fun Center and Arcade has to offer. Ralph Breaks the Internet (naturally) provides closure for this story thread, which is part of the reason why its directors aren't really thinking about a third movie. "I mean, I don't know because I feel good about where they're at. I mean you could envision like plot things where something gets screwed up and they have to reconnect to fix it. But in terms of it being a story of maturation for Ralph? Like he's really, like John Reilly said in the press conference. The internet represents the sort of adult phase of their life. And I think Ralph at the end, has matured where he is comfortable in his skin and he will make friends and he and Vanellope will still hang out. And Vanellope is just coming of age, she's just finding that thing that makes her passionate, and I don't know." Those aren't the only reasons Wreck-It Ralph 3 seems unlikely to happen, either. Disney has made direct-to-video sequels to its animated films in the past, but only recently broke from its tradition of not making theatrical followups to its animated features (with Ralph Breaks the Internet and next year's Frozen 2), and may be hesitant to immediately move on to making threequels next. Further, the Wreck-It Ralph sequel took six whole years to come together, even though its creatives were already tossing around ideas for the project back when the first movie was still in theaters. Since a third Wreck-It Ralph movie could take just as long (if not longer) to come together, its writers and directors might prefer to focus their efforts on an original venture instead, especially since they're happy with where Ralph Breaks the Internet leaves things. That being said: one should never say never when it comes to Hollywood sequels, and there's certainly a chance that the Mouse House will eventually move forward with Wreck-It Ralph 3, should Ralph Breaks the Internet become a box office hit as expected. In that event, however, it becomes a question of how how the third movie can top its predecessor, considering the sheer scale and complexity of the endless digital landscape that is the World Wide Web in the Wreck-It Ralph sequel. Johnston half-joked to ComicBook that "We did have this crazy idea that Ralph 3-D prints himself and comes into the real world somehow", so who knows - perhaps Wreck-It Ralph 3: Ralph Wrecks the Real World will indeed come to pass one day.